“I don't think there's any necessity to look at it before 2014 but I left the door open on everything,” Fiat CEO Sergio Marchionne, referring to a potential Fiat-Chrysler merger, said today. 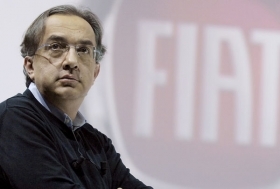 ROME (Bloomberg) -- Sergio Marchionne, the chief executive officer of Fiat SpA and Chrysler Group LLC, said he doesn't foresee “any necessity” of a merger between the two automakers before 2014. Fiat, based in Turin, Italy, will keep its headquarters in Italy after a potential combination with Chrysler “only if the investment conditions remain,” the CEO said today. Marchionne confirmed that he's in discussion with banks to refinance Chrysler's government loans and that Fiat aims to take a majority stake in the U.S. automaker. The face value of Chrysler's debt to the U.S. and Canadian governments is about $7.46 billion. Fiat, which owns 25 percent of Chrysler, is trying to improve productivity and capacity utilization to restore profitability in Italy, still the automaker's biggest market. Fiat is still losing money in Italy, Marchionne said today. “If the heart of Fiat will remain in Italy, we will have our head in several places: Turin for Europe, Detroit for U.S., one in Brazil and, in the future, one in Asia,” said the CEO, who today abandoned his usual casual look and wore a dark suit and a blue tie instead of a sweater. Fiat plans to invest 16 billion euros ($21.6 billion) and Fiat Industrial will invest 4 billion euros in Italy, Marchionne said, confirming the Italian automaker's pledge to spend 20 billion euros revamping its domestic plants. Marchionne, 58, caused a stir in Italy after saying earlier this month that Fiat and Chrysler may “end up looking like one entity,” possibly based in the U.S. He later backtracked, saying no decision has been made and the issue would be dealt with no sooner than 2014. But the comments drew the attention of Italy's leaders, including Prime Minister Silvio Berlusconi, who have met with Marchionne in recent days to seek clarification of his remarks. Fiat aims to raise its annual production in Italy to 1.4 million vehicles by 2014 from 650,000 in 2009. Fiat can gain a further 10 percent stake in Chrysler in two steps if the U.S. automaker reaches milestones including some sales goals outside of North America. Fiat has an option to raise its holding to 51 percent, a level Marchionne has said he aims to reach before the end of this year, after Chrysler repays U.S. and Canadian government loans.